Strictly speaking this project belongs to the Teaching & Reseach section. Furthermore, it is part of the EU project MACE. But it is a great installation and should be documented on its own right. 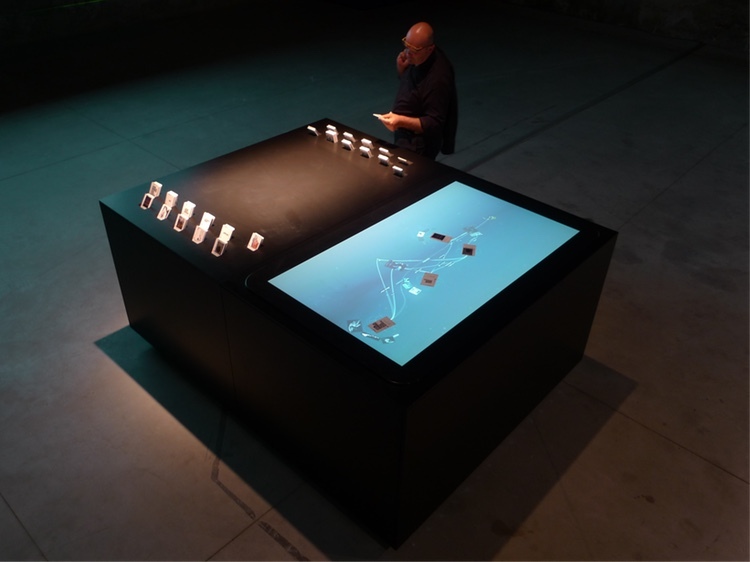 The interactive installation mæve (MACE-Everyville) provides visual and tangible access to the social and intellectual networks behind architectural projects. 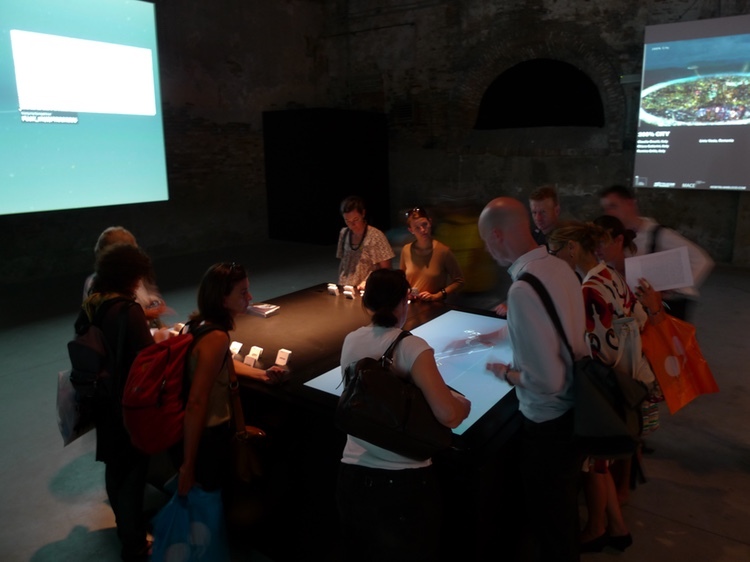 The installation was part of the 11th International Architecture Exhibition of the Venice Biennale 2008.
mæve connects the entries of the Everyville student competition and puts them into the larger context of MACE content and metadata. By placing physical project cards on an interactive surface, users can explore the presented projects, embedded in an organic network of associated projects, people and media. The installation consists of an interactive surface and a large projection area. 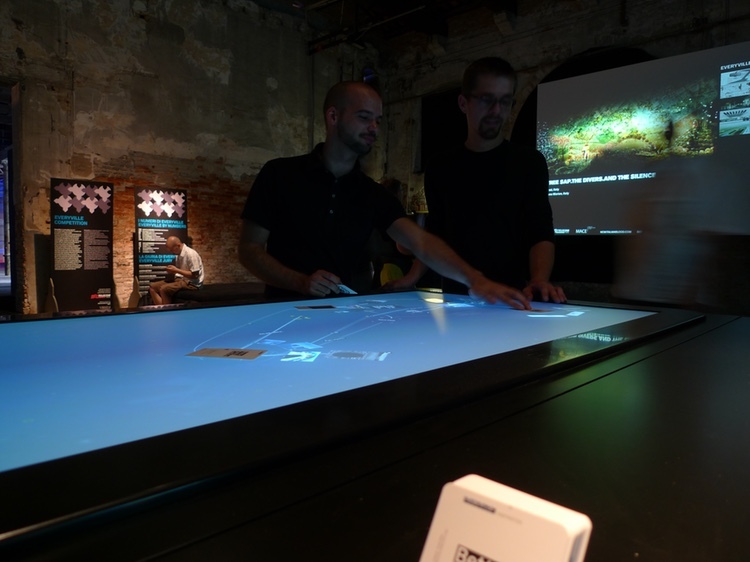 While users are interacting with the contents of the installation on the interactive surface, the network and the media files are displayed on the large projection. The ten winning projects from the Everyville student competition are represented as physical cards. 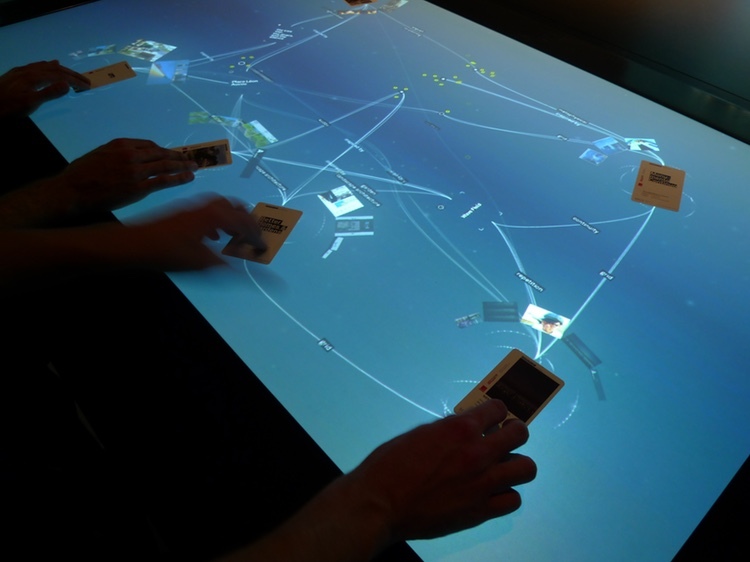 If a card is placed on the interactive surface, a contextual space is opened around the project. 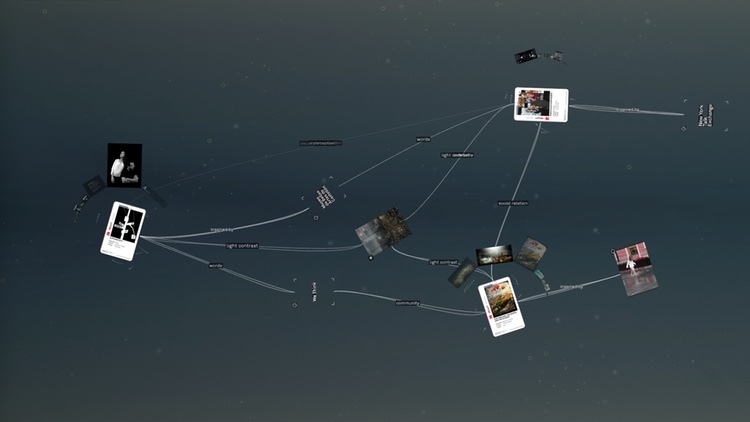 Within this space, media files, related projects and keywords are visualized. 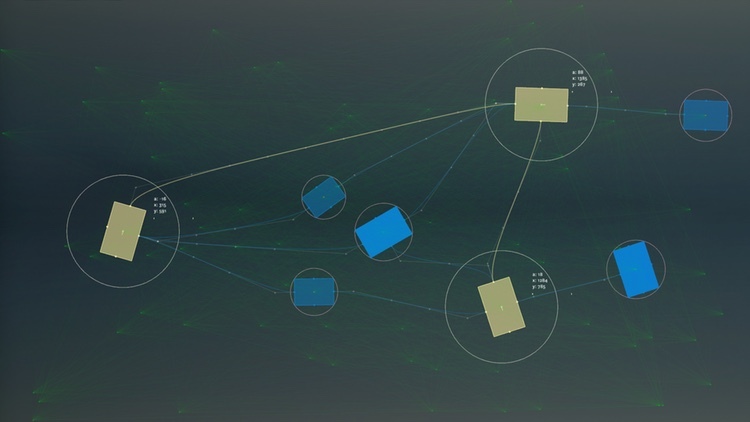 When a second card is placed on the surface, the space turns into a network, displaying similarities between the projects. In addition to the Everyville cards, the installation also contains “inspired projects” from the MACE repositories. These projects are also represented by project cards and enable the visitors to connect the Everyville projects to MACE contents. Furthermore, as the interaction with the cards is not limited to the one person, entire groups and teams can explore the content together. The installation is realised in Java and uses the Processing and Gestalt frameworks. For the card tracking, reactivision 1.4 software is used. The production of the table was supported by Werk5 in Berlin. MACE (Metadata for Architectural Contents in Europe) was a pan-european initiative to interconnect and disseminate digital information about architecture. In this context, the installation fosters understanding of the contextual space between different projects and evokes the idea of architecture as an extensive creative and intellectual network. maeve was designed and developed by the Interface Design team of the University of Applied Sciences Potsdam. Everyville 2008 was an initiative made possible by the collaboration of the Biennale with Gruppo Telecom Italia. MACE was co-funded by the European Commission, eContentplus Programme.